Omar Sy (born 20 January 1978) is a French actor and comedian. He is known for his sketches with Fred Testot and his role in The Intouchables, and for his roles in X-Men: Days of Future Past, Jurassic World, and Transformers: The Last Knight. 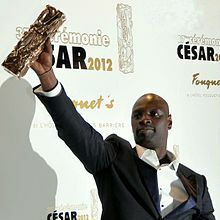 In 2012, Sy received the César Award for his role in The Intouchables, becoming the first recipient of sub-saharan African descent to win the award. The fourth of eight children, Sy was born in Trappes in the Yvelines department, France. His parents are both emigrants from West Africa. His Mauritanian mother worked as a house-cleaner, and his Senegalese father worked in a factory. He has Fulani origins. He was raised in low-income suburban housing projects. He appeared in the television game show Fort Boyard in 2006. Omar then went to Los Angeles, where he lent his voice to Zip in the French version of the Tomb Raider Legend video game. He previously had also voiced a sheep in Disney's Brother Bear. In 2008, he appeared in "Bienvenue chez les Bylkas", a video clip by Sinik. In 2009, he voiced some of the characters of Logorama with his partner Fred Testot. In 2011, he starred in The Intouchables, playing a streetwise young man who becomes the personal care assistant to a wealthy quadriplegic (played by François Cluzet). This film enjoyed tremendous popular success, with more than 19 million tickets sold. It topped the French box office in 2011 and became the best selling French film of all time at the French box office. 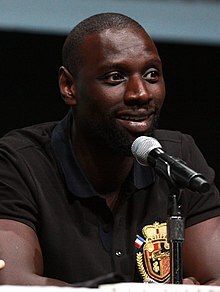 As a result, Omar Sy was voted third favourite French personality behind Yannick Noah and Zinedine Zidane. The role earned him the 2012 Globe de Cristal for Best Actor. He also received a nomination for a Satellite Award for Best Actor. He and co-star François Cluzet jointly were bestowed the Best Actor Award at the Tokyo International Film Festival. Additionally, he won the César Award for Best Actor in 2012 for the same film. On 30 December 2012, Omar Sy was voted favourite personality in France, based on a poll run by Le Journal du Dimanche, ahead of fellow actor Gad Elmaleh. In 2014, Sy appeared in X-Men: Days of Future Past, in which he played the character Bishop. He also stars in Samba, directed by Olivier Nakache and Éric Toledano. He co-starred in the fourth film of the Jurassic Park saga, Jurassic World, which was released in June 2015. In 2017, he voiced the character Hot Rod in the film Transformers: The Last Knight, the fifth installment in the Transformers series. On 5 July 2007, he married Hélène, the mother of his two children, in Tremblay-sur-Mauldre. They were together ten years before marrying. The family resides in a house in Yvelines Montfort-l'Amaury. ^ a b c d e Beardsley, Eleanor (28 June 2012). "In France, A Star Rises From An Oft-Neglected Place". NPR.org. National Public Radio. Retrieved 2 April 2015. ^ a b c d "Omar Sy, den orörbara!" [Omar Sy, the untouchable!]. AzurCultures.com (in Swedish). 10 January 2013. Retrieved 2 April 2015. ^ Lodge, Guy (3 December 2012). "Satellite Award noms run the gamut from 'Silver Linings Playbook' to 'Skyfall'". Hitfix.com. Archived from the original on 27 March 2013. Retrieved 2 April 2015. ^ Fritz, Ben (22 May 2014). "'X-Men: Days of Future Past': A Guide to the Mutants". Speakeasy blog. Wall Street Journal. Retrieved 2 April 2015. ^ a b c "Omar Sy Et Sa Femme Helene : Un Couple Amoureux En 5 Infos" [Omar Sy and His Wife Helene: A Loving Couple — 5 Facts]. PureTrend.com (in French). 22 June 2014. Retrieved 2 April 2015. ^ "Sy on Twitter". Twitter. Retrieved 10 June 2017. ^ AlloCine. "Teaser Norm : Omar Sy prête sa voix à un ours polaire qui veut sauver sa banquise". allocine.fr. Wikimedia Commons has media related to Omar Sy. This page was last edited on 10 April 2019, at 14:55 (UTC).